This season we are trying something a little different. Firstly, we will fly to Phaphlu (weather permitting) which is a much safer airstrip for landing. We will trek over Taksindo La, Kharikhola, Poyan and Ghat, joining the main Everest trail to Jorsale, above Lukla. The other major difference is that we will trek to Everest Base Camp first and THEN Gokyo. Dorje, our Nepali guide, assures me that the Cho La is just as difficult from either side. I have come to realise that although Gokyo is stunningly beautiful the EBC is often a first priority, perhaps even a long-held dream. So we will make sure you make that goal first. Because of the longer itinerary (28 days) I have to ask for $4400 AUD. The porters need higher salaries these days and we have a Nepali porter for each customer, carrying just one bag and walking with you each day. This is not typical. For comparison I believe World Expeditions charge $3700 for this trip but complete it in just 20 days. Must be jogging! 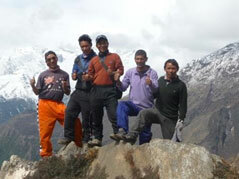 The latest trend with major trekking companies is to provide lodging and breakfast ONLY. On trek and in Kathmandu ALL your accommodation, meals and transport are covered. Alcohol and soft drinks the only extras. We cover permits, porter insurance and internal flights. We will have a Nepali guide AND ME! This is not an easy trek but I have made a very achievable itinerary. I have also made provision for a slightly less arduous ascent to Gokyo if Cho La is just a bit too challenging. I plan to take the easier route myself. With a porter each we always have options. In Kathmandu we will have two nights in a comfortable small hotel in the outer suburb of Kopan. We will go into Thamel for gear shopping, banking and last-minute shopping on 16 March. Real gear is a fair bit cheaper here and labels I call ‘North Fake’ are widely available. Lightweight super-down jackets $40, water bottles $5, fleece jackets or vests $10 to $20. You get the idea. Have a look at the ‘What to Wear’ page on my website at www.slowtrekking.com for more info. Also ‘Health Issues’ while you are there. You can email me at teresadb@hotmail.com or vonschwichtenberg@gmail.com with any questions large or small. I will be back in Australia on Tuesday 20th December, in Melbourne if you want to meet for a chat. I will be there until the trek in March. So, here is our planned itinerary. I always like to point out that these things are not written in stone. We may have to adapt to conditions on the ground – weather, health, etc. Bear in mind that on our last trek to this region the Cho La was not open. Let’s trust our karma and hope for the best. Arrive in Kathmandu from ‘wherever’. We will meet you and bring you to the hotel. In the late afternoon we will walk over to Bouda for dinner. It is the biggest stupa in Nepal, newly restored after the earthquake, and very atmospheric in the evening when the Buddhist community comes out to do ‘kora’ circling the stupa. A very busy day. Into Thamel for banking, gear shopping, etc. while I finalise your permits . In the evening we will hold a pre-trek briefing. Fly up to Phaphlu in a light aircraft. This is a nice, long, flat airstrip at 2500 metres, we may stay here overnight. To be decided. There is a beautiful old monastery just at the end of the airfield. If the weather is dodgy and prospects for better weather are doubtful we will quickly organise a jeep (or two). The drive takes all day but is on a sealed road (mostly). We may trek up to Taksundo La on the first day if our flight is early, putting the whole schedule one day ahead. We will then use this day where we find it is needed. A long day up to Taksindo La (3070 m). This is mostly on a sometimes- jeepable road but there is very little traffic. The incline is gradual. We trek through agricultural landscapes and then beautiful forest. The lodge is perched on a ridge and affords spectacular views of the big peaks in the middle distance. Ringmu is an option, one hour below the top if we are too tired. Now, for a few days, we head into an area I have not trekked yet; something I always look forward to. I will quote from Dorje’s notes. Down, down, down to Dudhkosi River, cross on a big suspension bridge to Jubing for lunch and the last hour climb up to Kharikhola (2040 m). 20 March Kharikhola to Poyan (2700 m). First we climb two hours to Bupsa and then another one and a half hours to Kharte. (2800m). From there we have a long ridge walk through bamboo to Poyan. I find that Dorje sometimes under-estimates the time required (for me anyway). He has written 6 hours trekking for this day so I am just thinking ‘all day’. March 21 Today we trek on a gradually downhill trail to Surke then gradually up to Chaurikharka. We then join the Lukla-Namche trail near Phakding. We will finish at Ghat (2600 m). A busier trail with trekkers who have flown into Lukla, we follow the river valley on well-made trails. Ghat to Jorsale (2750 m). An easier day, up and down across the river on suspension bridges. Into the Sargamartha National Park. Staying in the river valley which is intensively farmed on the flats and flanked by steep wooded hillsides and towering peaks like Kussum Kangaru. The Nirvana Garden is a tranquil little lodge with big beds and hot showers. It is a bit of a climb up to Namche Bazaar at 3440 m but we should be there in time for lunch. Namche defies description, you have to see it for yourself, but it has cafés, internet, gear shops and throngs of trekkers. Don’t pet the yaks! March 24 We will be fairly well-acclimatised because of the way we trekked in but we will still climb up and over Kunde and Kumjumg (the first Hilary school) and then down to Kangzuma (3550 m) which is almost the same altitude as Namche. Stupendous views of Thamserku, Ama Dablam, Lhotse and, the big one, Everest. March 25 The day starts with an easy downhill trek to Phunki Tenga and then a long, hot climb up to Thangboche (3860m). Views from here are often wonderful. There is a large monastery. A half hour amble downhill through stunted rhododendron woods brings us to Devouche. Two maps I have consulted say 3820m. Hard to believe as it is a fairly steep downhill run from the ridge. Today I would hope we make Dingboche at around 4400m. Pangboche, for lunch, is at 3930 m. It could be a bit optimistic so we will just have to see how we go. Altitude will be the issue. The trail is beyond spectacular, often high above the icy green waters of the river. Stunted vegetation, tundra, cedar and azaleas just a foot tall. If we made it to Dingboche yesterday we have a very easy ascent of less than 200 metres over about five kilometres to Togla. If we stopped at Pangboche we can still trek to Pheriche (4200m) for lunch and then climb up to Togla (4600) in the afternoon. If we lose a day here because we need more acclimatisation we can make it up later. (Kangzuma to Phakding is an easy enough day on the way back). We will keep our options open. I have had some customers for whom the Base Camp holds no real interest, they just like being ‘up here’. If anyone decides that this is enough for now and wants to travel, slowly, to Gokyo, we could organise that. Just because you are on this trek nobody will ‘make you’ go to EBC. March 28 It is not far from Togla (4600 m) to Lobouche (4910 m) BUT it does start with a stiff climb up a zig-zag trail to Togla Pass. It is only about an hour but at this altitude you will feel it. From there onwards the trail ascends quite gradually until it is almost flat for the last hour. Lobouche is just a few lodges. A ten minute walk and then a ten minute climb brings you to the bank of the massive Khumbu Glacier. Amazing to stand quietly and listen to the river of ice creaking and cracking as it inches downhill. Keep warm. It is a deceptively easy-looking trail at first but at this altitude any uphill walking, however slight, is hard. Then it gets harder. Clambering over rather jagged rocks on an ill-defined trail uphill to Gorak Shep (5100 m) is tough going but you will get to the lodge for lunch. The lodges at Gorak Shep are nothing to write home about. If the weather is good this is an ideal time to trek out to Everest Base Camp after lunch. You will be wearing ALL your clothes tonight but there will be a yak-dung fire in the dining room after five. Having consulted with Dorje, and Des, it seems practical to rest after lunch and stay in Gorak Shep tomorrow. Hopefully we get a clear morning for the climb up to Kala Pattar. If the weather was brilliant yesterday afternoon we might have reversed these activities. Kala Patter is at 5550 so it is a 450 metre climb, hard going at this altitude. It is said to be one of the best views in the world and certainly gets you ‘up close and personal’ with Everest. Keep your camera batteries warm in your sleeping bag overnight. Last time I was there the weather was cloudy so we headed off back downhill straight after breakfast. Just saying. As above, we may stay two nights at Gorak Shep. You can climb Kala Pattar and visit Base Camp. Order to be decided by the weather. After your climb and a large breakfast the ‘B Team’ will all head down. You will be amazed how much more ground you can cover on easy terrain going downhill. At this point I will be heading down further than the ‘A’ team. I will be hoping to make it to Pheriche but, if not, Togla would set us up for the next day. If you stayed two nights at Gorak Sep you can now set off early. Lobouche is only a couple of hours downhill so, after a bite of lunch you could trek two or three hours gently uphill to Dzongla at 4830. Eat well and rest in the afternoon for your big day tomorrow. I haven’t done this but Dorje has and I have met lots of trekkers (not all athletic types) who have crossed from this side. Dorje will make sure that you are well-briefed. It is bleakly beautiful up here. If we made Pheriche yesterday we have an easy run down to Pangboche and then a spectacular trail, high above the regular trail, leads us to Phortse. It is almost all downhill so even if we bailed out at Togla yesterday, we can still make Phortse but it will be a long day. Truly spectacular. April fool’s Day! Cho La pass (5420 m). I am sure it will be a really tough day but Dorje will take care of you all. It is a long, way down to Dragnak (4700 m) on the far side of the Cho La so pace yourselves. Good luck. Phortse (3810) to Dole (4200). Looks easy on paper. However the day starts with a long, easy descent to Phortse Tenga (3680) and then climbs 500 metres up to Dole. Phortse is a lovely village high on a plateau. There are sometimes deer in the woods on the way down. The views across to Ama Dablam are unbelievable. Today you will trek down to the glacier and Dorje will guide you across it. It is very important that you follow his instructions here. You should make Gokyo reasonably early though you might have had a little lie-in after your big day yesterday. Rest. You will need it. We have a reasonable day today. Nothing is ‘easy’ up here. The trail to Machermo is fairly level, rising only gradually. I like these earthen trails, not so hard on your legs. We reach Machermo at 4470m. Many trekkers will append two nights here to acclimatise but we may have already been higher than this on the EBC trail. Stunning views. You will probably want to climb Gokyo Ri this morning. Some mad types will ‘go the early’ to see the sunrise. I did it at nine o’clock last time. It was still lovely. The B Team, which will be me and anyone else who felt the Cho La was too hard, will join you today. Let’s see what sort of shape we are in when we get there. Down, down, down. Some members of the B Team may want to climb Gokyo Ri first. Or not. We will be aiming for Dole (4200) . However, the last two times I was on this trek we got held up at Machermo with heavy snow. Beautiful scenery whizzing past as you trek easily downhill, no longer fighting gravity. We are not sure how far down we came yesterday but we are sure to make Kangzuma. It is a nasty climb up to Mong Danda which is nearly 4000 metres but the trail after that is gloriously easy downhill till near the end when it climbs gently up to Kangzuma at 3550. Well-made trails and unbelievable scenery above and below. It is a longish day with downs and ups but sets us up for the last couple of days. April 6 Today we should just nip around the corner for two hours back to Namche (3440). However, if we took an extra day acclimatising around Dingboche in the first week we will just drop by Namche and then trek down to Phakding(2610), or thereabouts. All fairly straightforward downhill trekking. We can spend the morning in Namche and then slowly trek down to Phakding. (These days may be slightly different depending on how the rest of the trek has panned out). Should be relatively easy. From Phakding (2610) it is fairly gentle up and down through the valley, crossing the river here and there. Save a little energy though as the trail climbs steeply back up to Lukla (2840) for the last hour of the day. We will book our flights out of Lukla for this day and, as long as flying conditions are good we will be in Kathmandu for breakfast. Be prepared though. We landed in Kathmandu last time just as the sun was setting. Any flight which gets you back on the day you planned would be considered a success. No plans for the rest of the day. Hopefully, we flew down yesterday but this day is kind of spare, just in case. If we are in Kathmandu we will go into Thamel and shop and do a little sightseeing. Big pizza dinner anyone?? Some folks are booked to fly out today, but not until late. We can arrange some kind of sightseeing for you or you can spend some time in our local area. Our project for kids, computers and sewing are here and there are lots of interesting little workshops. Kopan Gomba is marvellous and just a half-hour walk away. If your flight is not yet booked I suggest today late in the day or tomorrow morning. It certainly is a big trek but only a couple of the days are really long or arduous. I do it and I am 62 and no athlete. If you like the idea but don’t want to do all of it, or leave out the hardest parts, we will organise it for you. Places are limited so do get in touch soon if you would like to be included. Lots more information, pictures and reports of previous treks on the website at www.slowtrekking.com.